On a February morning in 1998, tragedy struck the Bailey family and Arizona State University. A van carrying members of the Geography Club and the Friends of Geography group, who were on their way to visit a copper mine in Bagdad, Arizona, experienced a terrible accident resulting in the injury of several students and the death of Matthew Bailey. Matthew Bailey was a senior, majoring in geography, at the time of his death. Matthew was a senior geography student and active member of the Geography Club through the School of Geographical Sciences and Urban Planning, then known as the Department of Geography. Matthew, who lived in Japan for several years, was also minoring in Japanese. Through his travels, he gained a geographer’s insight into Japanese society. Matthew may have found himself following in the footsteps of his father, Bob, who held a PhD in geography and whose research is foundational for other geographers. In the 1980s, Bob identified and described ecoregions in the United States. Ecoregions are large areas that have relatively homogenous ecological and geographic conditions. His work continues to inform geographical research nationally and globally. Matthew and Bob both enjoyed the fieldwork aspect of geography and would often work alongside each other. They had plans for research they would conduct following Matthew’s graduation. Sadly, they never had the opportunity to fulfill those plans. Following Matthew’s passing, Bob Bailey was instrumental in the creation of the Matthew G. Bailey Scholarship through the ASU Foundation. This scholarship fund helps to support the work of students to help them accomplish the fieldwork that is integral to their work — the fieldwork that was also important to both Matthew and Bob. On Jan. 14, 2019, Bob Bailey passed away. He was just two months away from celebrating his 80th birthday. Through Bob’s love of his son Matthew and generous support of the Matthew G. Bailey Scholarship, 50 young geographers have been awarded scholarships to help support their research through fieldwork. Each year, Bob would travel to Tempe from his home in Colorado to attend the school’s annual awards reception to announce the winners of the award created in honor of his son. “I first met Bob under the worst of circumstances in February of 1998,” said Breandan O hUallachain, professor in the School of Geographical Sciences and Urban Planning, who was serving as chair of the Department of Geography at the time of Matthew’s passing. 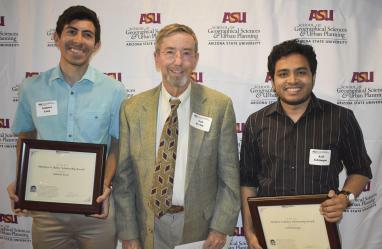 Bob Bailey (center) presents the Matthew G. Bailey Scholarship to two recipients, Gabriel Leon and Asif Ishtiaque, during the 2017 School of Geographical Sciences and Urban Planning awards ceremony. Our school’s community of geographers and urban planners, students and faculty, alumni and friends extend our deepest sympathies to the Bailey family on the loss of Bob. We continue to thank and will always remember Bob Bailey for his longstanding, generous support of our students and for his scholarly contributions to the field of geography. In honor of Bob’s unending support of the Matthew G. Bailey Scholarship, donations to the scholarship account can be made here.